Our Titanium Magnetic Golf Bracelets are ultra lightweight and hypoallergenic. All of our titanium golf & sports jewelry are crafted with neodymium north facing permanent magnets that will not loose their strength over time. The men’s & ladies titanium rings and titanium wedding rings will last a lifetime just like the titanium magnetic bracelets & necklaces. From Anonymous of Nashville, Tennessee on 7/20/2007 . 7/20/2007 – How many magnets are in the bracelet? 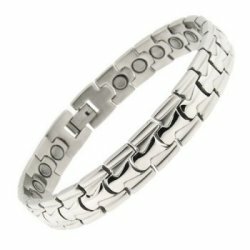 Response From FirstFairway: The bracelet has up to 31 magnets included!